*SCHOOL FEE FOR THE YEAR 2018-19 COULD CHANGE SUBJECT TO KHDA APPROVAL. Activity Fee Dhs.600/- per annum. *PAYMENT OF TERMINAL FEES IN ADVANCE MANDATORY WITHIN 10 DAYS FROM THE DUE DATE FOR FS TO YEAR 10. “Apple International School” has partnered with Gulf Pinnacle Transport LLC for provisioning transport service to our students. Gulf Pinnacle Transport (GPT) (www.gulfpinnacletransport.com) is strongly committed towards providing quality transport service by maintaining the highest level of safety, outstanding customer service and positive employee relations. They take great pride in bringing international best practices and technology to support education by making sure children have safe, comfortable and reliable transportation to the School and back home. The drivers of GPT and female bus attendants of the school are trained to follow the safety standards as per the requirements of Apple International School, GPT and Road & Transport Authority, Dubai. 1.Gulf Pinnacle Transport operates the buses in compliance with the guidelines of regulatory authorities.2. All drivers of GPT are fully trained, holding RTA issued school bus driving licence and participate in our ongoing drivers’ training courses. They undergo a minimum of 40 hours of Safe Drivers’ Training Course, in a year. 3. All buses have designated pick up and drop off points. 4. It is the responsibility of the parent(s) to ensure that their child / children is/are at the pick-up point at the designated time. Buses will not leave from collection points ahead of schedule. However, due to traffic pressures, buses will not be able to wait at pick-up points after the scheduled time. Due to traffic delays buses may arrive at pick-up and drop-off points behind schedule. 5.Children up to Grade 4 will not be left at the drop off point unless the designated adult is present to collect them. Adults designated to pick up children should carry photo ID in the event that verification of identity is required. In case an adult is not available at the drop off point the children will be brought back to school and handed over to the School Administration. Parents should then pick the children from school. 6.Written request, signed by the parent/guardian, for reasons of safety and security, is required if a drop-off other than usual is requested. 7.Parents are required to inform the drivers / Operations Executive if a student is absent on a particular day. If a student does not want to use the return trip on any particular day the parent should give a written communication / send an e-mail to the Operations Executive. In case of change of residence, provision of transport service will be subject to the availability of seats on established routes. Fees as applicable to the new pick up area as per the fee structure will apply. 8. Children with contagious disease are not permitted to travel in the bus. 9. For safety reasons, eating and drinking on the bus other than water will not be permitted. 10. For safety reasons, all passengers are prohibited to bring sharp or hazardous objects inside the bus. In case of such event that the passenger has brought an object which can considered as a safety concern, the object will be confiscated by the Bus Attendant and same will be handed over to the respected School Authority. 11. GPT reserve the right to decline provision of service. Allocation of bus facility will be based on the availability of seat in the bus plying in the area. 12.All GPT vehicles, drivers and passengers are insured. In case of any claim due to accident, the company’s liability is limited to the comprehensive compensation paid by the insurance company, as per the terms of the insurance policy. 13.Parents or guardians shall compensate the company for any damages caused / sustained by the bus orother travellers as a result of inappropriate action by their child/children. 14. GPT may use e-mail id / mobile number of the parents for conveying messages / sending newsletter / circulars. 1.All students who require the services of GPT shall apply in a prescribed form available on the website or at the school. 2.The application form available on the website gulfpinnacletransport.com or at the school counter should be completed and submitted by the parent. All asterisk marked columns must be filled up. 3.Every transport user should have a NFC Technology Identity Card in order to take the Electronic Attendance. Student should always carry their ID card with them while travelling the GPT buses. This is emphasised for the safety of the students. 1.Based on the signed up application form / online registration student will make payment of fees based on the fee structure applicable in the particular school. 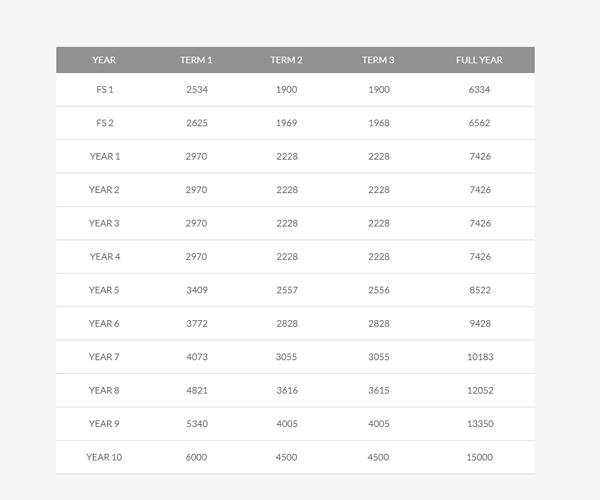 2.Transport fee is applicable and charged for ten months in an academic year, divided in three terms. Full payment for each term should be done irrespective of the number of working days. 3.In case of new admissions during the term, after 15th of the beginning of the term, fee will be charged on pro rate from the date of start of service. If the transport fee is not paid before the fifth of the first month of the term service will not be available from the next day. In case of direct payment of transport fee to GPT by the parent’s Companies it should be informed at the time of registration. The Companies should be advised to make the payment latest by 10th of the first month of the term failing which the service will be declined. 1.AED 150/- will be charged in case of dishonor of cheques. 2.Only cash / credit card payments will be accepted in case of dishonour of cheques. 1.Invoices can be collected from the school / GPT counters at the time of payment. 2.The individual Proforma invoice shall be issued to those parents who will be getting re-imbursement from their employer. 1.Transport Facility once availed will not be withdrawn during the term. No refund will be made for the unexpired portion of the term, in case of withdrawal from transport facility. In case of discontinuation due to transfer from school at least two week notice should be given to the Representative in the specified form. In case of transfer a copy of the transfer certificate should be handed over to the representative of. In this case fee will be charged till the month (inclusive of the month) the student uses the service. 2.Discontinuation of transport facility for the ensuing term should be intimated in the specified form (available with at the counter in school / at the website) at least two weeks before the end of the previous term. 3.The fee shall be paid till the month the student leaves the school (inclusive of the month). If the payment is done for the full year or term refund will be done for the succeeding months. 4. In case of temporary discontinuation due to long leave for more than a month on medical grounds etc, a letter should be submitted from the Principal along with the discontinuation form, for the approval of competent authority. No temporary discontinuation is permissible for the months of June, December and March. 1.Fee refund is applicable only in cases where fees for more than one term have been paid by the parent and facility not availed for the succeeding term(s). 2. In case of temporary discontinuation on medical grounds the fee paid can be adjusted for the next term / month, if approved by the competent authority. 3. In case of discontinuation for any reason other than at the end of the academic year, a ‘service charge’ of AED 100/- is applicable. This charge will also be applicable for return of Post Dated Cheques. 4. Refund shall be made only through account payee cheques (in the name of the parent who had initially paid or any person authorized by the parent) and not in cash. 5. Any adjustment for fee waiver / change of area shall be done by the third working day of the subsequent month. 1.The parents should provide the Area Change form (available at the GPT counter in the school / website) to the Representative of GPT in the school. The parent will be informed of the availability of seat in the bus plying in the new area.